Since many birds are insectivorous, their study often requires an accurate understanding of the arthropod prey community, including studies into resource selection, dietary overlap, and drivers of population density. However, ornithologists struggle to properly apply arthropod sampling techniques for a variety of reasons. First, there are many different arthropod sampling methods to choose from, each with their own problems and biases. Secondly, some habitats, such as forests, are structurally complex, with many different microhabitats that likely have different arthropod communities. Therefore, the central problem for ornithologists selecting a sampling method is that the arthropod community sampled by the selected method must align with the community of arthropods available to the study species. 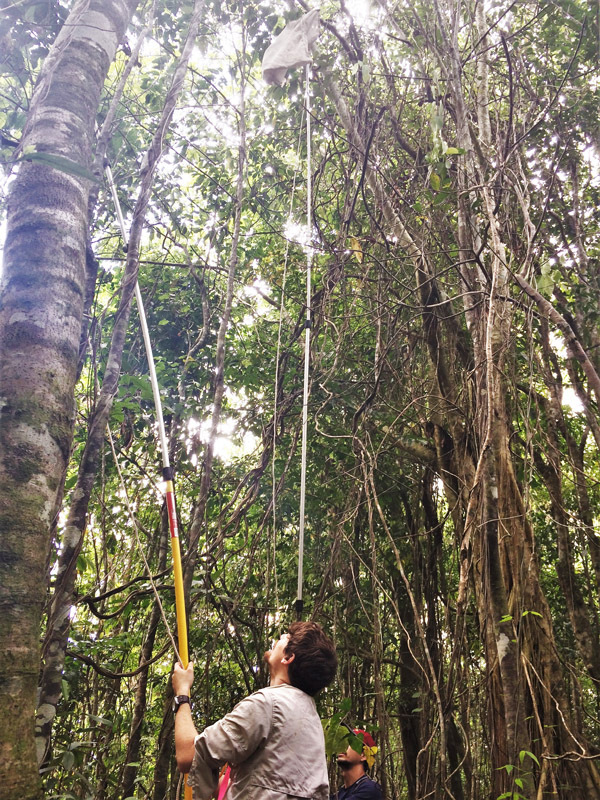 In this study we examined four common methods of sampling available arthropod prey: branch clipping, sweep netting, and two applications of sticky traps: hanging traps, in which they were hung in the airspace, and collar traps, in which they were wrapped around tree trunks. These methods were chosen as they are all cheap, quick to deploy, and easy to conduct without specialized training. First, we examined what variables affected the arthropod community for each method, and then we compared the arthropod community sampled between methods. Overall, all four methods sampled drastically different arthropod communities, with branch clips sampling more spiders, sweep netting more true bugs, collar traps more bark lice and hanging traps more flies. Furthermore, both sticky trap methods sampled more flying insects compared to branch clips and sweep netting, which performed comparably. Additionally, both branch clips and sweep nets sampled a higher taxa richness than either sticky trap method, though they also took more samples to characterize the arthropod community and more time per sample. We find that researchers should try to select a sampling method that best aligns with the prey community of their species of interest. However, they should also be aware of the different biases and problems that may arise with each method. For instance, the low species taxa richness obtained by the sticky traps could cause problems for some studies of prey preference as many potential prey taxa would be missing from the available prey data. Similarly, we identified a potential bias towards flying insects in our collar sticky traps that ornithologists should be aware of prior to selecting this method. Lastly, unlike some previous studies, we found that branch clips and sweep netting performed similarly, and we would recommend them for researchers that wish to sample a large range of prey taxa, and to select the one that is most operational in their study site.